Well, here is a real run-in with an Audi RS4 on my way home from a trip to Switzerland. 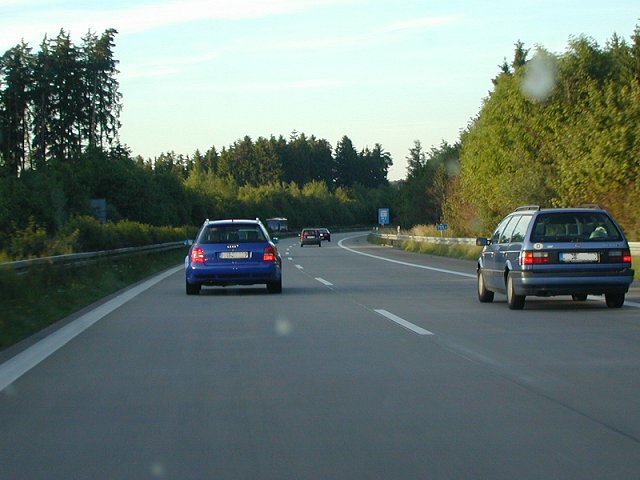 This happened on a clear Sunday (02.06.2002) on the Autobahn A7 towards Wurzburg in Germany. As I wanted to get home I was traveling quite fast. Well, as luck would have it I caught up with an Audi RS4 that was stuck in traffic ahead. Naturally I had to seize the opportunity and set up the RS4 for some fun. Thus I closely drove up to him kinda like telling him to move over. There were 2 possibilities for the Audi RS4. Either he moves over to the right lane and lets me pass or he accelerates. Since I had a heap of hours behind me and my M3 was all warmed up I knew how to approximately get the most out of my M3. After the traffic in front of the RS4 cleared up it was a go. From that point on I double shifted from 6. to 4. gear. This was at aprox. 100 mph. By the way: I was in the SMG mode "5", DSC active, sport mode "off". It was more than obvious that he didn't want me near him. So he pressed it to the metal! Consequently I did the same. Drove the revs up very fast and then shifted to 5th @ approx. 7900 rpm (shift lights) and then to 6th reaching top speed again running @ approx. 6400 rpm. I let myself fall back some 70 feet in order to sort out my brain and cool down a bit After that I continued to proceed with the "hunt". I bet he thought I had given up. Thus I was again approx. 30-50 feet behind. ok ok, no comments please. Then the road ahead was free again and we pushed it once more. Always going into 4th in order to be at 7900 rpm and make the shifts up the gears. Again, I was thrilled. The sound off the exhaust, the speed at which I reached 168 mph was mind boggling! Hell, I was even in the position of overhauling the RS4, albeit very slowly! Even Autobahns have many curves and whilst driving them at speeds of 160+ mph you could feel how solid and controlled the M3 felt on the road! The RS4 on the other hand had quite a hard time as it "swam" over the pavement. I actually got a bit scared watching him! At this point it was clear that the 380 turbo bhp RS4 was not all that it was cracked up to be. I'm sure the RS4 driver had all hands to do to. I am now totally convinced that for the large part SMG contributed to the success of me staying with the RS4! The super quick shift processes played a big roll! In addition I had the advantage of the rev. range in my M3. The RS4 had to shift gears allot sooner than I needed to. I could see the shift points on the RS4 by the smoke clouds coming from his exhaust. When traffic held us up again, I snatched my digicam I had lying on the passenger seat. Thank God I had one picture left on it. We had many more runs and it was great fun. After I had realized that the Audi RS4 didn't have a chance I drove on the middle lane, up beside him. I then looked over towards the RS4 driver and gave him a big "thumbs up". To my surprise he looked back and smiled at me - twitched his shoulders, threw up one hand and slightly bent his head. Gesturing to me while smiling - "sorry, I gave it all I could" I smiled back to give him another "thumbs up" and he acknowledged with the same gesture! I must tell you that this is NOT common practice in Germany! So it felt even better. He was roughly 40 years old and he obviously enjoyed it as much as I did. We where going extremely fast for a long time (160 mph). The whole affair ran very very civilized with no bullshiting. We both had great fun! I CALL THAT TRUE SPORTSMANSHIP!! It was simply awesome! The whole experience lasted approx. 35 miles and thus we had plenty of opportunities. But, unfortunately we had to separate as I had to get on another autobahn segment. When he noticed I was parting him he immediately turned on his warning lights. I was already on another lane but nevertheless flashed my lights. I hope he saw them. My God, I can't wait until my M3 has about 7000 miles on it (at present 3250 miles) and everything is all loosened up and feels even free'er. Folks: That's what's it's all about!! No matter what kind of car you drive! Thus, have fun and drive carefully! Currently 10 users are browsing this web site, 628062 having visited since June 8th, 1997.